Summary: Loyalty. Envy. Obligation. Dreams. Disappointment. Fear. Negligence. Coping. Elation. Lust. Nature. Freedom. Heartbreak. Insouciance. Audacity. Gluttony. Belief. God. Karma. Knowing what you want (there is probably a French word for it). SayingYes. Destiny. Truth. Devotion. Forgiveness. Life. Happiness (ever after). As they chase storms and make new friends, Zoe tells Hannah she wants more for her. She wants her to live bigger, dream grander, aim higher. And so Zoe begins teaching Hannah all about life’s intangible things, concepts sadly missing from her existence—things like audacity, insouciance,karma, and even happiness. My Thoughts: Yes, I definitely saw the beauty of this one. It was written pretty great and it was pretty beautiful. But I also had a hard time connecting with the story and the characters both. I couldn’t really relate to either Hannah or Zoe and that was a huge problem for me. We meet Hannah and Zoe. Zoe is bipolar. The girls have been best friends since they were kids and Hannah knows how to calm Zoe down. She can really speak to her. Zoe and Hannah go on a road trip. During this road trip they do so many things and encounter so many events. Crazy and fun events. Confusing events. And we also meet their families in the book and boys. And that ending, wow. I did really like Zoe’s little brother. He made things even more interesting while we saw him. 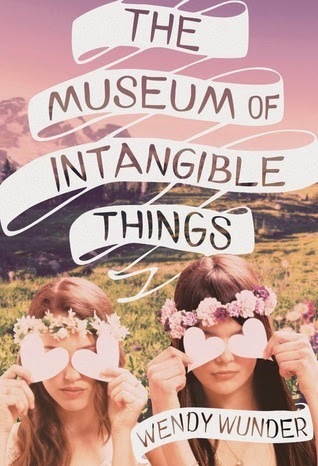 The Museum Of Intangible Things was a unique book. It was moving and crazy intense. Overall: I liked this one but I debated between 3 and 4 cupcakes. I didn’t really connect to it like I thought I would. I also thought this one would be a 5 cupcake book for me but it wasn’t. I enjoyed it. It is probably more of a 3.5 but I’m rounding it up this time! A lot of people will love this one! Even more than me! Cover: Love it! I love hearts and the background. Really cute cover!